I love Battle Network, it is the bombs (I'm the same anon that didn't relish trashing X7 in the threads below) great art, music all that jazz. It has within it some of the most unique and deep RPG gameplay designs, that work really well, when done right etc. I also (outside of Legends, I hate that s***) absolutely detest actively putting games down, or being super critical about every little thing in a game. I don't like criticizing at all, and would rather express things I like. That being said, as sad as it is to say, this is quite frankly, one of, if not THE worst game I've ever played. That is no small phrase, I've played games that make Sonic 06/Superman 64 seem well made and fantastic. I can go on and on about why it's bad, but I won't. It's the only game that when it shows up I feel the need to express and inform about my negative opinion. What were they thinking? I can almost find no redeemable quality with this title outside of music. Damn I hate that my favorite franchise has what I consider such a bad game (as well as the horrid Legends series). I try and forget MMBCC ever existed, why won't you let me Capcom? To me I have a lot of fun with the game with each character has their own stories mainly my favourite character Mary Towa(who sadly never appear in future BN games). To me the game try to be like BN4.5 only this was done in a way most player not familiar with so I am not surprised why people don;t enjoy it. I love the way how we can transfer code to our friend instead rely on connectivity so that we can still PVP anytime and anywhere we want. To me the strongest point of the game is the way how the using the card and they way it set up can affect the battle experience.In the general series of Battle Network 1-6,all we have to do is rely on strong combo of program advances,chip then voila game is complete while this game try to make us use different card, different navi and different slot of "L" and "R" so that we can prepare well.We even can make the Navi give comment so that we know if we have the right combination for the upcoming battle. Is kinda like the Zelda 2 disaster where most Zelda fan don;t enjoy the gameplay due to it;s not different kind of game-play,the MP system and the different type of difficulty where levelling up is a must. @CATGUN:The Battle System... Alright you set up your chips then the only thing you are allowed to do is watch the battle, you have no control outside of one special Navi trait you're allowed once or twice a round. The Battles play themselves. How can you compare that to the deep intricate battle system of the main games or 4.5? It's nothing at all like 4.5, if you liked playing different Navi/characters 4.5 is that done right. The Navi giving you a comment that you have the right combination doesn't help anything. How does that help with link play, where your opponent has a well made and diverse chip set? How does it help with the way the chips aline randomly in the game making you use not the most ideal chips for specific situations or turns? You can't even use something as extensive as a chip folder in its entirety, you are limited with the chips you have on the board, and once you run out you're screwed! You can't even move your characters to dodge the inevitable attacks. Why is this game so limiting? BN 1-6 does not rely on good chip combos and program advances, you are lucky to set those up before your opponent at best, and if you are playing through the game for the first time, they are in no way easily accessible outside of cheats. I've seen and been a part of link vs play where a player makes a come back with no chips left and very little health through sheer skill. I can describe one too. It was BN3 The "winning" player was Elec Guts, had a Guardian on his panel 1-3u and a chip chain of Air Shot 3 and Zeus Hammer. The loosing player was Wood Shield absolutely no chips on hand a navi cust of Under Shirt and a mine on the opponents panel. They both hid behind Guardian, the winning player had to use air shot before he could get to Zeus Hammers, so the loosing player shot the guardian took the hit from it, blocked the air shot gained life back, took the hit from Zeus Hammer used the hit invincibility and rapid fired (since Guts Style can't keep up with long range fire power) the once winning player, chasing him into the mine, thus taking the game. This was within like the first few weeks of the game's release. I've seen much more and better developed cust, Style, panel, chip setup and strategies since then. How can you compare that kind of gameplay. Why do you like something so restricting? I'll have to try it at some point for the heck of it. I've played every main series title + Star Force, but I never found an opportunity to pick this one up. If it's cheap enough, I'll pick it up when I get a Wii U. Fingers crossed for a translated Japanese BN6. I feel obligated to suggest you get the game through Ebay. Which you can generally find at a super low price. The reason I suggest this is because the game works best as a portable game that you can play casually. It's pretty similar to cell phone games of today. I, personally, enjoyed it but can't say I would want to sit in my living room playing it for extended periods of time. But it's great for long trips where you just need to kill time. And the world was flooded with underwhelming joy. Worst game I have every played. I played it through once, an obligatory must as a Mega Man fan. The game wasn't bad, and it certainly wasn't complex. In fact, the droning simplicity of it kinda became addicting after a while. Again, it's not a bad game, it just isn't entirely a "game". What I mean by that is that you don't necessarily play it, you kinda watch what unfolds on the battlefield after you've created your deck of Battle Chips. There's no overworld movement or places to go. It's all done on the fly in a tournament style fashion, like the game suggests. So, for all the people quickly rushing to call it the worst game ever, keep in mind that it's not. What it does, it does right. 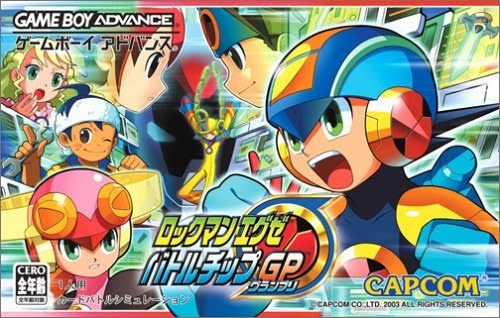 Graphics are on par with all the other Battle Network games, the music is catchy and suitable, the ability to play as other characters and compete against a variety of previous bosses. It just doesn't do much. Take it or leave it. How? I have and can name specific reasons for my hatred of Legends. I'm not gonna pretend I like something I clearly hate. I can list what I hate about the games, series and fans in a sensible fashion but it will get removed here. OK one quick little one I dislike the lock system. OK done (hope my comment lives). Also I hate Legends completely separately from MMBCC, I treat them differently. In fact I (almost) hate Legends less than MMBCC, since I actually really love MMBN, it hurts me much more that this game was so bad. I could care less for Legends though. Just you naming its features sounds bad. You can't just throw its bad gameplay away with statements as simple as "it just isn't entirely a "game" " or "What it does, it does right". You just sound like you're excusing every single element of its nonexistent game design. Not being able to play 95% of a game's proposed features is bad game design. If anything you saying it's not a bad game is damaging the credibility of your opinion. Only in this world, does something as bad as this skate by, and is accepted. I'm not excusing anything. Everything it proposes, it delivers, albeit not too much. Lacking BN's acclaimed battle system is what hurts it. Like I said, take it or leave it. There's a reason there wasn't a sequel. I understood what you meant the first time. To me, lets say a game was glitchy or had technical flaws, but the ideas and direction the developers were going for was good and legitimate, I am more willing to excuse something like that. Now if the devs specifically designed games based on bad ideas and directions intentionally, that is 100x worse to me. To me you ARE excusing it with statements like "the game wasn't bad" or take it or leave it. It most definitely was a BAD GAME. It didn't only lack MMBN's battle system, it lacked its two worlds explorations, its customizations, its playable levels, its enemy encounters, the list goes on and on... The one feature it had going for it (multiple playable Navi/characters) other games did better (MMBN 4.5, 5, and 6). It is just a complete downgrade in every way, except maybe musically. Also despite hating Legends (I hate it so much) more than MMBCC, I can acknowledge that as a game, it is miles better than MMBCC. There is no doubt about that. I still like MMBCC aesthetically for the most part, but honestly the main games do just as well and beyond in that department. So there is absolutely no reason to pick this title up over the others. It lacking all of what I mention and not having something else to compensate is what makes it a bad game. It intentionally being made that way doesn't make it better, in fact, like I said before, to me it makes it even worse because of that. It is broken by design not glitches, it is good looking because it uses previous MMBN's graphic assets and style. There being nothing like it out there doesn't make it a good game either. It's a piece of tech (not calling it a game) that should always be left if you want a proper gaming experience. I gotta admire you tho, if you truly refuse to trash MMBCC as a game, and always look at the positives, that says something about your fan level of this series. I wish I was more like that, in this case. Well like I said the music is still solid, but that's not saying much since 98% of MM soundtracks are great. I think most people bought this game out of bargain bins for $5. Paying 702 yen (or $7) for a digital copy seems like it might not be worth it. Especially considering the game's dubious quality. So it's actually a little more than just a direct port? That is kinda cool. Since this game is coming over, I wonder if there's any hope that we'll get the cell phone games Phantom of Network and Legend of Network. The idea behind Phantom sounded like a lot of fun to explore.